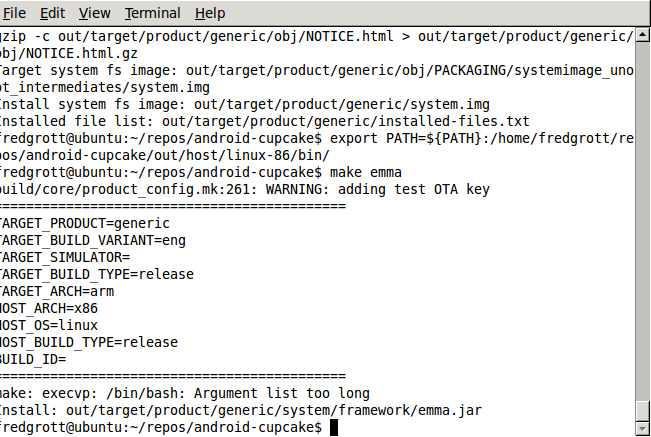 AS you may have figured out by now thee are missing pieces to the EMMA instructions that developers have posted to the Android mailing lists. I will be publishing my own set of instructions soon. In the mean time, the file coverage_targets.xml in android-repo/development/testrunner has to be changed ot include the android application you are copying to the samples directory. Thus, I am creating a sample project and a Google Knol to detail the steps. Here it is the 1.5r2 Linux EMMA enabled SDK build. Remember, the EMMA support if alpha and thus you should do a search of the developer’s list as Brett’s instructiosn for using EMMA is in there and he does answer questiosn about using EMMA. As you migth know EMMA unit testing coverage is somewhat in starting stages. I have placed beginning EMMA unit coverage tasks in my andCooper Build tool project. The problem is that there is no Android SDK EMMA instumental builds to enable it. Now, here is where get effing mad. The reason I charge for doing certain Android stuff is to be able to afford to do this type of above stuff for the Android FOSS community. AndroidTapp.com you are getting it with damn both barrels fully loaded. AndroidTapp.com is a for profit company and thus when they asked for an Android Widget be produced I though gee I can get some bills paid and that would allow me to produce the Android SDK EMMA Instrumental build for the community so that everyone could try EMMA unit test coverage their Android Applications. Because Android Tapp.com, a for pofit company, does not want to pay for Android Wdiget development the Linux Android SDK EMMA instumental buildso that you have full EMMA test coverage of your applications using AndCooper has been delayed. To be fair, the owner of AndroidTapp.com did not knwo that I was using the low Android Widget dev price to pay some blls so that I could grab some time ot do the Androd SDK EMMA instumental builds for the community. Hmm, actually that kind of sounds worse doesn’t it? If someone knows of company that has a small Android Dev Contract they want completed, could you let me know so that I can put the Andorid SDK EMMA Instrumental Builds back on track so the community has them to use in real EMMA unit coverae testing of their applicaions. Sorry for the rant,Brett’s directions in how to modify the bootimage after the build is here(towards bottom of the page).